Oddly enough, it was almost a year ago today that I did my one other ice cream review on this blog. That flavor was probably a little less polarizing than Mission to Marzipan, because I don't know many people who dislike cheesecake brownies, but I know a lot of people who dislike marzipan. My German wife got me hooked on the stuff (we've even visited Luebeck, where marzipan was supposedly first created), and after chocolate, it's probably one of my favorite dessert flavors. 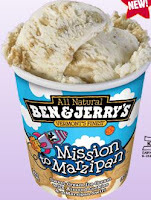 The marzipan in this new Ben & Jerry's flavor isn't exactly Niederegger quality, but it's still pretty dang good. I initially bought it for my highly pregnant wife, but I confess that I think I've eaten more of it than she has. The sweet cream ice cream would probably be pretty delicious on its own, but the almond cookies and marzipan swirl make it downright addictive. A must-try for anyone who likes marzipan, and it might even win over some marzipan skeptics. The only thing that would have improved it is a little dark chocolate somewhere, but then again, I think chocolate improves pretty much anything. I finally tried the Wasabi-Ginger pop from Lollyphile and it was a bit of a let down. Maybe they spilled some of the Maple-Bacon batch in my batch of Wasabi-Ginger, but it wasn't all that gingery and it definitely didn't have much wasabi. It mostly tasted like sugar with a vaguely ginger aftertaste. Of the three flavors I've tried so far, I'd have to say that this one falls in the middle. Absinthe had a strong flavor, but a strong bad flavor. Maple- Bacon was actually pretty tasty. This one was just meh. I've never really paid attention to the "Juan's Basement" feature on Pitchfork. Juan apparently invites bands to jam in his basement and then he has an informal interview with them. His latest victims are Blitzen Trapper, a band I'm coming to appreciate more and more. Having watched this edition of Juan's Basement, I can honestly say that if I saw these guys walking down the sidewalk, it would take some mental effort not to walk to the other side of the road to avoid them. But they're pretty amusing, and their music is highly entertaining. Check it out if you have 15-20 minutes or so to spare. Or, just check out my favorite song from this short set below. The one and only movie I've seen in theaters recently was Slumdog Millionaire, which was playing at the tiny crap theater down the street from where I live. It's pretty much pointless to review of a film that just won best picture and has had tons of publicity. If you've seen it, you know it's good. I have no idea whether or not it deserved best picture since I didn't see anything else that was nominated. If you haven't seen it, you probably should. Whether or not you think Slumdog Millionaire deserved the accolades it received, it's hard to deny the skills of Danny Boyle as a director. He's joined the ranks of David Fincher, Wes Anderson, and Jean-Pierre Jeunet as one of my favorite directors of the past decade or so. What sets Boyle apart from some of these other directors, however, is the sheer diversity of his movies. There's the underrated Shallow Grave (a remarkable effort for his first feature), Trainspotting, the turn-the-genre-on-its-ear zombie film 28 Days Later (the last movie I saw in theaters twice), and though I haven't seen it yet, his sci-fi film Sunshine is reportedly excellent. And then there's Millions, a DVD I got for free after sending some cereal box tops in. Millions is dubbed a "family" film, and I'm assuming it is Boyle's only PG-rated movie. Set in Britain, a little boy finds a huge bag of money--British pounds that will be useless in a few weeks when the currency is converted to the Euro. The film follows our protagonist, Damian, and his brother, showing what they do with the money. There are elements of fantasy (Damian is obsessed with saints and talks to them throughout the movie) and crime--the money turns out to be stolen, and the thief wants it back. It's a bit of a hodge podge, actually. Nevertheless, I loved it. I'd even go so far as to say that I liked it better than Slumdog. It has its semi-cheesy tug-at-the-heartstrings moments, but they really did tug at my heartstrings. I'm not gonna lie. I cried at one point. Shut up! A movie hasn't made me do that for a while, and it actually felt pretty good. If you've been avoiding this film because you thought it was just for kids, I urge you to check it out. The bottom line is, I knew Boyle was a solid director, but his two "Million" movies have confirmed that he'll be a force in film-making for a long while yet. I hope he continues to experiment with genres--a western or straight-up comedy might be nice--and I hope he can maintain the high standard he's set for himself. Hmm...robots that look like people and don't know that they're robots, and don't want to be robots. Sounds kind of familiar, doesn't it? BSG has, let's face it, wrung this sci-fi plot line for all it's worth. And though I haven't started watching this last season yet, I'm willing to bet they've done it better than this movie will. Just sayin', is all.